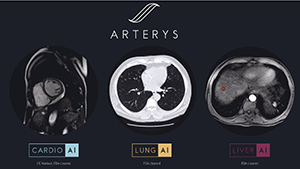 Arterys has announced that its Oncology AI imaging software has received 510(k) clearance from the U.S. Food and Drug Administration (FDA). The software suite is web-based, and assists radiologists and oncologists measure and track tumors or potential cancers. Its initial approved deep learning workflows ill be for liver computed tomography (CT) and magnetic resonance imaging (MRI) examinations and for lung CT scans. Oncology AI is designed to assist radiologists by providing a simple web browser that helps them confirm, evaluate, quantify, and report on the presence or absence of lung nodules and liver lesions, along with their key characteristics. The software’s capabilities include single-click automated segmentation of lung nodules and liver lesions using deep learning and automated longitudinal tracking of nodules across multiple studies. It also provides intuitive LI-RADS workflow and score calculation. Oncology AI runs on the Arterys MICA (Medical Imaging Cloud AI) platform, which the San Francisco-headquartered company states is easier to deploy than on-premise imaging systems. Arterys receives FDA 510(k) for oncology imaging software. Appl Radiol.